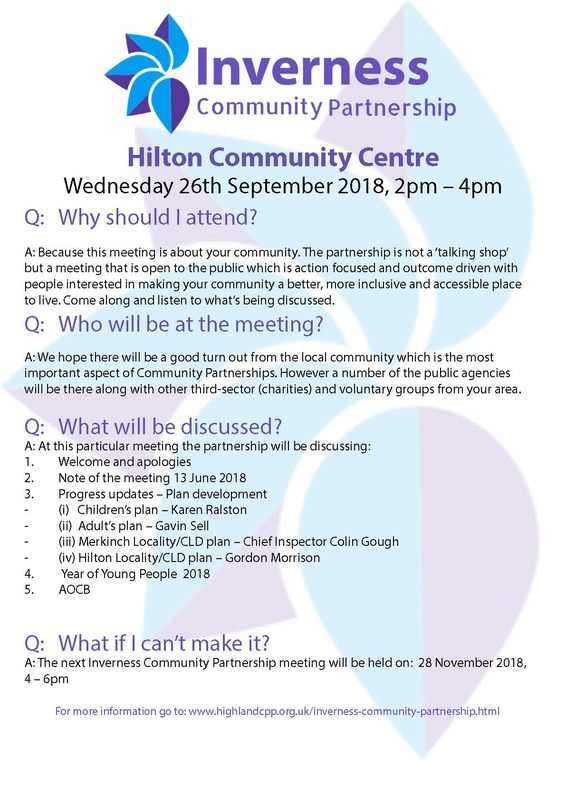 Members of the public are invited to come along to a meeting of the Inverness Community Partnership which will take place on Wednesday 26 September 2018 from 2pm to 4pm at Hilton Community Centre in Inverness. The focus of the agenda will be about receiving updates on the Locality, Children’s and Adult Plans for Merkinch which set out priorities to improve the quality of life for the people who live and work within the community. Discussion will also take place around the first steps to be taken in the development of a locality plan for the Hilton area. The Inverness Community Partnership was formed following the introduction of the Community Empowerment Act 2015. Membership includes representatives from public agencies, the third sector and voluntary groups who come together to work together with the people of Inverness to focus on priorities and deliver better outcomes for the Partnership area. Hilton Community Centre can be found on Oldtown Road, Inverness IV2 4HT.